The Odessa barb is a beautiful aquarium fish, but less well known than its famous barb relatives like the Cherry barb and the Rosy barb. The Odessa barb can still be tricky to find in ordinary pet stores and you might have to visit a fish auction, contact a breeder directly or purchase them over the Internet. The Odessa barb is a benthopelagic and potamodromous freshwater species native to South East Asia; from the Himalayas to Thailand. It’s native region include Bangladesh, Bhutan, China, India, Laos, Myanmar (Burma), Nepal, Pakistan, Sri Lanka and Thailand. Odessa barbs live in the upper Mekong, Meklong, Irrawaddy and Salween, as well as in the upper parts of the Chao Phraya basin. 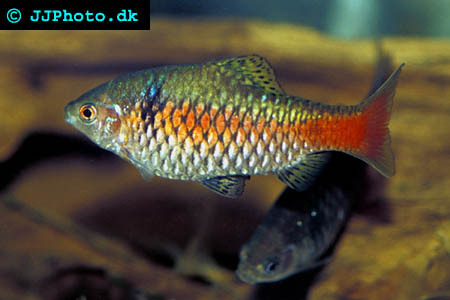 The typical Odessa barb habitat consists of still and shallow marginal water in rivers and streams. The bottom is often muddy and the Odessa barb spends a lot of time browsing near the substrate in the shallow water. Odessa barbs typically reach a length of 5-7.5 centimetres (2-3 inches), but can grow up to 10 centimetres (4 inches). There are no noticeable size difference between males and females, but the males have slimmer bodies. The Odessa barb has a light brown body colour and the sides of the fish are decorated with two black spots. The black spots are more distinct in males. Both sexes can display red-brown banding. In sexually mature males, the red-brown band will turn into a thick bright red band that starts at the tip of the mouth, proceeds through the eyes and continues down the side to the tail. During the breeding period, it is also common for the male to display more intense body colouration than normally. Odessa barbs should always be kept in groups consisting of at least 5 Odessa barbs, preferably more. Keeping fewer Odessa barbs will usually result in very shy fish that spend most of their time hiding or sitting at the bottom of the aquarium. The stress from being alone can also weaken the immune system of the Odessa barb and make it more prone to illness. The aquarium where you keep your Odessa barb group should be at least 60 centimetres (24 inches) in length. Try to mimic the natural Odessa barb habitat when you set up the aquarium. The wild Odessa barbs inhabit still, marginal water of rivers and streams in South East Asia. A well planted aquarium is recommended, but an open area for swimming should also be included in the set up. Compared to tropical fish species, the Odessa barbs are used to rather cold water temperatures; from 14 to 22°C (64.5 – 71.5°F). They are therefore suitable for unheated indoor aquariums. he Odessa barb will do best when you keep the water neutral or slightly acidic and the ideal pH range is 6.5 – 7.0. When it comes to water hardiness, the recommended dH is 10. As mentioned above, Odessa barbs appreciate rather cold temperatures and the preferred temperature range is 14 – 22° C (64.5 – 71.5° F). Wild Odessa barbs are omnivore and feed on plankton, insects and crustaceans. In the aquarium, they are usually very happy eaters as long as they are healthy. They will accept most types of food. You can for instance use a high quality tropical flake food or granules as a base, and give your Odessa barbs occasional treats in the form of live, freeze-dried or frozen worms, shrimps, daphnia etcetera. Beef heart is also appreciated. The wild Odessa barbs a highly prolific and has a minimum population doubling time of less than 15 months. The Odessa barbs are egg scatters and they do not engage in parental care. Approximately 150 eggs will be released in batches of roughly 20 at a time. After one day, the eggs will hatch. The fry will be then become free swimming within 24 hours. If you want to breed Odessa barbs in captivity, you should ideally keep them in a well planted aquarium. As mentioned above, they are egg-scatterers that do not raise their young, and they will therefore not hesitate to eat their own eggs and/or fry in the aquarium. If you want to ensure a high fry survival, you can set up a special fry raising aquarium and remove the adult fish after spawning. If you do not wish to arrange a separate aquarium, you can let the Odessa barbs spawn in their normal aquarium but make sure that it is very densely planted with bushy aquatic plant species that will create a lot of hiding spots for the young Odessa barbs. Java fern is one example of a suitable plant. A lot of eggs and fry will still be eaten, but at least a few specimens will usually survive into adulthood. As mentioned above, Odessa barb fry usually hatch after one day and become free swimming the next. When they have become free swimming, you can start feeding them newly hatched brine shrimp. Even though the fry is small at this stage, they can usually manage to devour newly hatched brine shrimp. As the fry grows larger, you can feed them bigger and bigger brine shrimp. If you keep your Odessa barb fry on a nutritious diet and keep the water quality up, they will grow really fast. The two distinctive spots will start forming when they are no older than a month.